Last week saw the launch of a new UCL Special Collections display outside the Donaldson Reading Room entrance on the 1st floor of the Main Library. Dante’s Divine Comedy: Modern Visual Representations features a selection of printed materials inspired by the great medieval Italian poet’s literary masterpiece. Produced over 700 years ago, the Divine Comedy is still celebrated today for its incredible imagery of the afterlife. The twentieth-century publications chosen for the display contain their own distinctive illustrative depictions of Hell, Purgatory, and Paradise, but are united in the way they seek to capture elements of Dante’s extraordinary imagination. The display is scheduled to run until Tuesday 26th June. Running alongside this display and throughout the summer term are two public programmes dedicated to Dante. 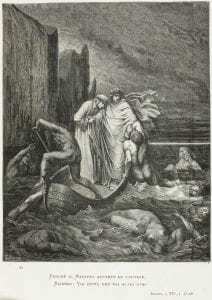 Weekly readings of the Divine Comedy take place on Monday evenings at the Warburg Institute, Woburn Square (6:00 – 7:30 pm), while talks about Dante, his life and works take place on alternate Tuesday evenings at the Italian Cultural Institute, Belgrave Square (7:00-8:30 pm). Both programmes are free and open to all. On Tuesday 29th May, UCL Special Collections will be at the Italian Cultural Institute to present a selection of highlights from the Dante Collection from 18:00-19:15 pm. In addition, Tabitha Tuckett (Rare-Books Librarian) will be providing expert insights on the Collection in a public talk at 18:30 pm. We hope to see you there. Why is the Mediaeval Italian poet Dante important to us now? Can his work tell us anything about how to approach our own lives? And what does UCL Special Collections have to offer those interested in Dante? Tonight’s reading is from the Inferno, but tomorrow’s session is on love. Both courses are free and open to all. Look out later in term for displays of selected items from our outstanding collection of rare and early editions of Dante’s works. Read more about UCL Special Collections’ Dante Collection, or search the library catalogue using ‘Dantecollection’ (without spaces between the words).